Fletcher Hall is a four-story residence hall at the University of Wisconsin Oshkosh, built in 1964 and primarily utilized by freshman students. A $25.8-million renovation and addition was undertaken, increasing resident beds to more than 500, along with adding kitchen and lounge spaces. Completed for the 2017-18 academic year, the project featured 100,000 square feet of renovated space, plus a 16,000-square-foot addition. 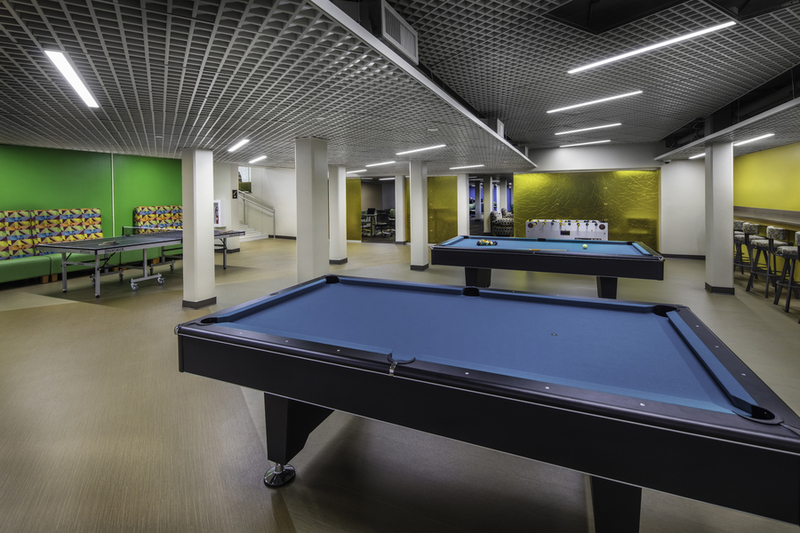 Mavid Construction faced a number of different challenges that were met by the 12-person installation team (six on carpet/resilient flooring, six on ceramic tile) over the course of the 15-month project (June 2016-August 2017). Even with the project lasting more than one year, the work schedule was compressed in order to reach completion in time for the 2017-18 academic year. The biggest challenge centered around the fact that the majority of the project involved remodeling a building that was more than 50 years old. Working with the existing flat slab, tile installers needed to create a pitch in the shower areas, while completing their intense tile work from floor to ceiling. Additionally, the dorm rooms themselves were small, necessitating work in compact spaces a majority of the time, a fact exacerbated by other trades needing to be in those same areas. Other obstacles overcome included material lead times and scheduling sufficient manpower during some of the busiest months. 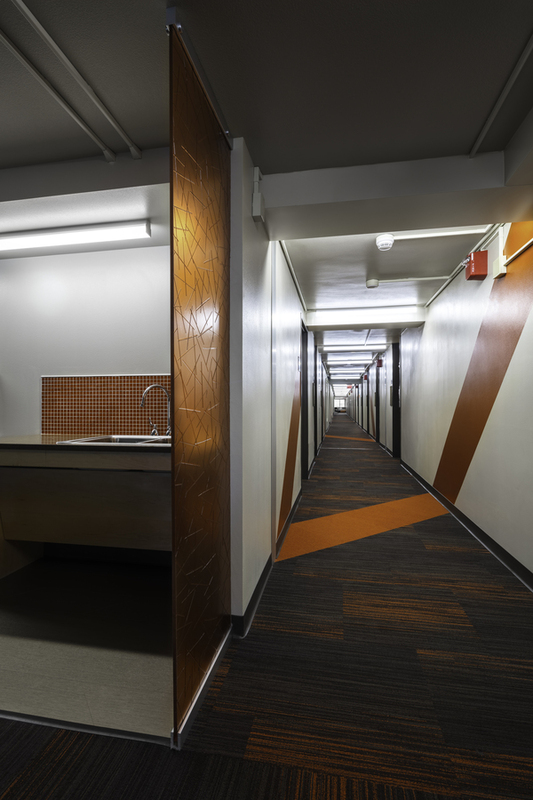 An assortment of Masland carpet tile patterns, in custom colors, were installed in the residence hall’s corridors, lounges, and other public spaces; these included Inside Scoop, Lingo, Echo and Runway. Paris Tweed carpet tile by Bentley and Armstrong Luxury Vinyl Plank (with Quiet Comfort underlayment) was installed in lower-level living areas. Six Daltile ceramic tiles – Modern Dimensions 4×12 (2), Keystones 2×2, Invoke 12×24 porcelain, Rittenhouse Square 3×6 and Clio Mosaic field tile – were installed on bathroom floors, walls, ceilings, showers backsplashes, along with kitchens in the lower-level living space. MATS Inc. Design Track, including frames, was installed in the lower-level and first-floor vestibules. All floors had Johnsonite rubber and vinyl cove base, plus transitions and reducers, installed. 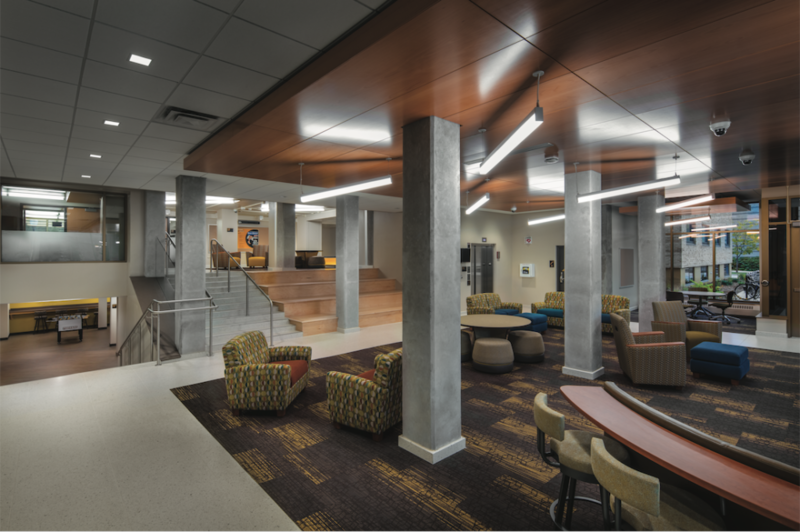 As part of its sustainability efforts, UWO initially desired LEED Gold certification. However, renovation of a building constructed in 1964 did not lend itself to the required envelope changes needed for LEED Gold, so LEED Silver became the goal. Many of the LEED points attained are the direct result of good design, along with the selection of materials and systems. All of the carpet tile selected had a certain percentage of post- and pre-consumer recycled content and met the standards within the CRI Green Label program. Flooring and ceramic tile products helped to earn points in the MRc4 Recycled Contact category and IEQ 4.3 Low-Emitting Materials.